Book with a stupid name Superfreakonomics by Steven Levitt & Stephen Dubner appeared to be quite surprisingly interesting and was listened on my way to work and back home in a week or so. 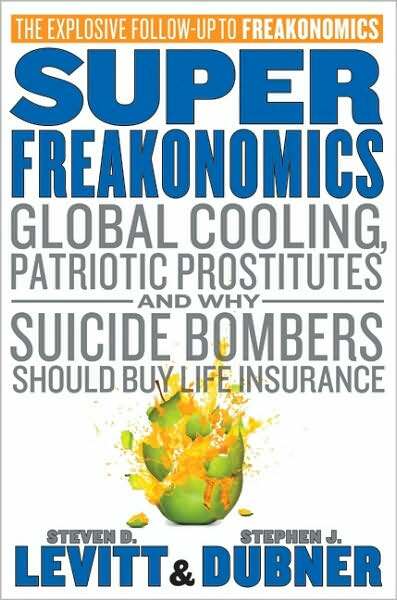 I would probably even say that the sequel is better than the first book – Freakonomics. Authors position themselves as economists doing research into non-conventional topics. However, I feel that it would be more appropriate to say that book is in the sociology field. Yes, individual & group level economics is often discussed, usually through the prism of decision-making. But in overall it’s more about psychology. Topics covered are global warming (or cooling?) & ecology, technological & scientific breakthroughs, economics of prostitution, algorithmic search for potential terrorists based on banking activity and human altruism which is covered in more details in video below. In other words, as authors confess themselves, there is no uniting topic. Superfreakonomics is full of curious facts. For instance, you have statistically higher chances to get into trouble if you walk home drunk then if you drive home drunk. All topics are presented as stories revolving around particular characters and therefore easily digested. One of the main lessons sounds quite banal and generic: “people respond to incentives, sometimes unpredictably”. However, we forget about it more often than we’d like to think.